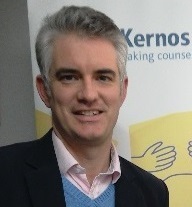 South Suffolk MP James Cartlidge visited Kernos on Tuesday 16th February to meet the therapists and find out more about the Centre and the range of counselling services that we offer. His visit was also to lend his generous support to our current bid for funding from the Children & Young People’s Emotional Health and Wellbeing Fund, which is offering grants to organisations helping those from this group of people who are suffering emotional and psychological distress. The visit was reported in the East Anglian Daily Times and the Sudbury Mercury – the EADT report can be read here. James is a member of the All-Party Parliamentary Group on Mental Health, which is currently taking evidence from the many local and national organisations that deal with mental health issues. 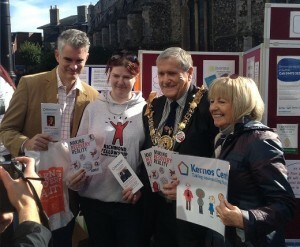 Last October, together with the Mayor Cllr. Jack Owen, he joined staff from Kernos on the World Mental Health Day stall in Sudbury to help highlight the range of local support available in the town and the surrounding area for people suffering from mental health problems. James also attended the Kernos AGM in January, subsequently tweeting: “Humbled to hear the incredible work done by volunteers of @KernosCentre Sudbury. At AGM agreed to help press for funding”.